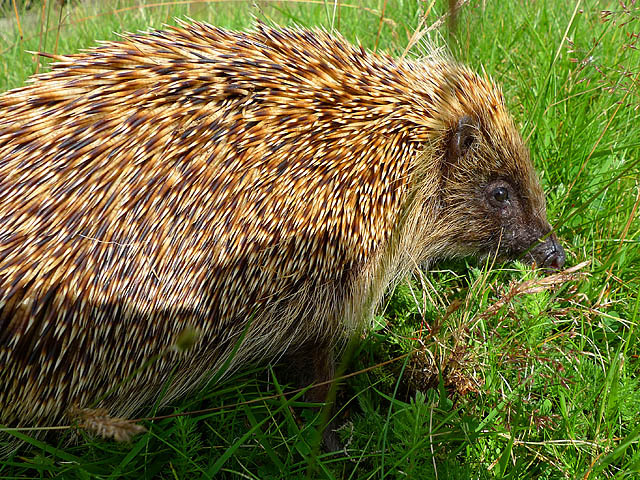 Hedgehogs are Britain's only spiny mammal and has about 6,000 spines. Underneath they have coarse brown fur. Eat slugs and earthworms and sometimes eggs. Heart beats 300 times per minute, on average. Roll up into a tight ball to protect themselves from predators. Have poor eyesight, but a good sense of smell and hearing. The spines of a newborn hedgehog begin to appear within 24 hours. The desert hedgehog eats scorpions by carefully nipping off the scorpion's deadly sting before eating it.